Increasing clouds with showers arriving this afternoon. High 57F. Winds SSW at 5 to 10 mph. Chance of rain 60%..
Cloudy. Slight chance of a rain shower. Low 42F. Winds SW at 5 to 10 mph. 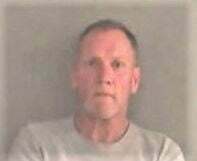 According to the incident report, the suspect attacked Jesse Price of Ottawa with a chainsaw during an altercation in the Ottawa area of Boone County. Price suffered lacerations to his right wrist, left elbow area and his left side. Price was transported to Boone Memorial Hospital for treatment of his injuries. The incident report was prepared by Cpl. Kevin D. Harper with the West Virginia State Police. As of press time, Brown was being held at Southwestern Regional Jail without bail.